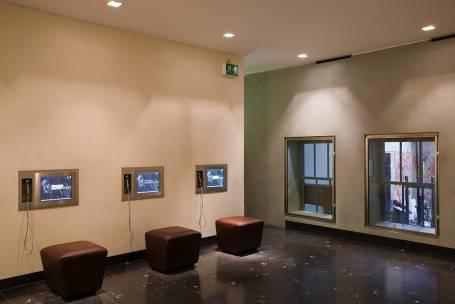 The Hugh Lane Gallery is a gallery of Modern and Contemporary Art located in Charlemont House, Parnell Square North, Dublin. It is run by Dublin City Council. “The purpose of the gallery is to promote civic pride and understanding of its collections and to contribute to public discourse on the visual arts” (www.hughlane.ie/about-us; Website of the Hugh Lane Gallery). The exterior of the Hugh Lane Gallery. The collection of the Hugh Lane Gallery was initially donated by Sir Hugh Lane to the city of Dublin in 1908 and has grown greatly since then through the purchase of Modern and Contemporary artwork by Dublin City Council and through bequeaths and donations to the Gallery from art collectors and artists. The collection consists of over 2,000 artworks which date from the mid 19th Century to the present day including works by international artists such as Monet, Manet and Renoir amongst others and Irish artists which include Jack B Yeats and Harry Clarke. In recent years the gallery received a boost to its collection with two new donations of the “Francis Bacon Studio” and a series of work by the artist Sean Scully. The gallery is named after Sir Hugh Lane, a cork born art collector and dealer who believed that there should be a gallery of Modern Art in Dublin showing the best of International and Irish artists. A Nephew of Lady Gregory, Lane was one of the foremost collector and dealer of Impressionist Art and ran his own gallery in London. Hugh Lane devoted much of his short life to establishing a gallery and a collection of modern and contemporary art worthy of the city of Dublin. In 1915 he died tragically on board the Lusitania enroute to America. Originally the Hugh Lane Gallery was located in Clonmell House, Harcourt Street but the gallery moved to its permanent home in the newly refurbished Charlemont House in 1933. 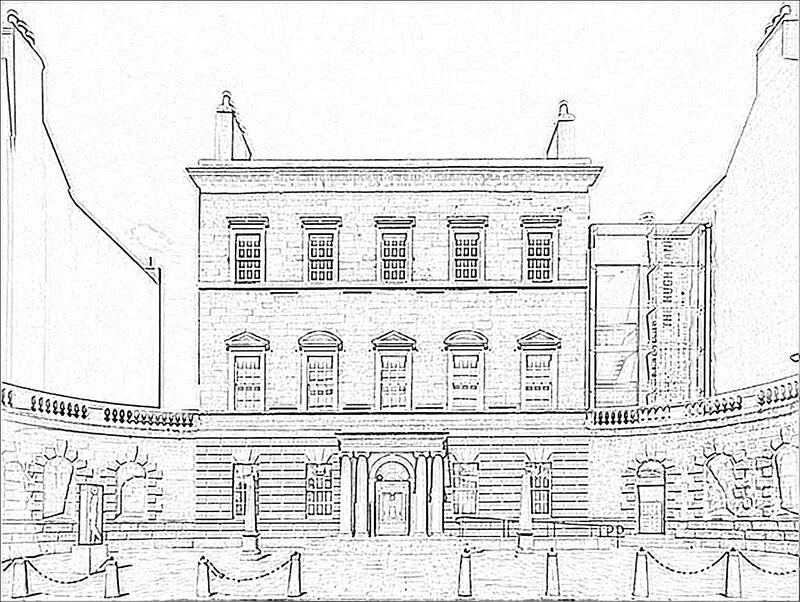 It is a Neo – Classical building designed by William Chambers and James Gandon which was built for James Caulfeild the first Earl of Charlemont in 1763-65. In 1933 a purpose built gallery was extended at the back of the building designed by city architect Horace O’Rourke. In 2006 a new wings was designed by architects Gilroy McMahon which increased the exhibition space and enabled facilities for visitors including a Learning Resource Centre, a bookshop and a cafe. Francis Bacon was an Irish-born London based artist known for painting disturbing representations of the human figure. His portraits of people were often grotesquely distorted. When he was 16, Bacon left home in Ireland and travelled to London and onto Berlin and Paris. It was during this period of travel that Bacon discovered the work of Picasso who inspired him to become an artist. On his return to London in 1928 he began painting. It took several years for Bacon to become successful as an artist. In 1944 his triptych “Three Studies for Figures at the Base of a Crucifixion” brought him acclaim from art critics. From then onwards Bacon was regarded as one of the most important international post war artists. During his life Bacon enjoyed a great deal of success as an artist until his death in 1992. In 2013 his “ Three studies of Lucien Freud” set a world record at that time as being the most expensive piece of art selling for 142.4 million US dollars. Francis Bacon; Three Studies for Figures at the Base of a Crucifixion, 1944. Oil and pastel on board, Tate Britain, London. 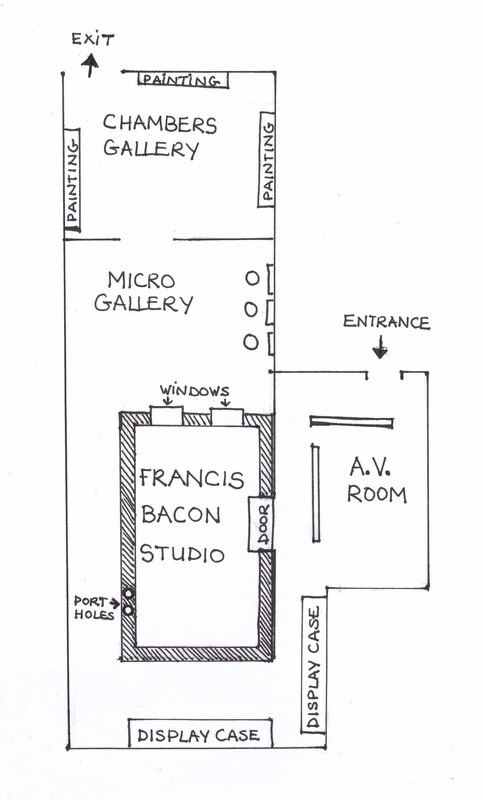 The studio of artist Francis Bacon is permanently housed in the Hugh Lane Gallery. It was donated to the gallery in 1998 by John Edwards the sole heir of the artist. Originally located in Reece Mews, South Kensington in London, Bacon had worked in that studio from 1961 until his death in 1992. The Hugh Lane Gallery entirely relocated the studio and its contents from London to the gallery in Dublin. A team, led by conservator Mary McGrath and comprised of archaeologists and curators mapped, tagged and packed each of the items, including the dust. The walls, doors floor and ceiling were also removed. Over 7,000 items were found scattered around the studio including paintings, drawings, books, records and an endless array of art materials and equipment. The relocated studio opened to the public in 2001. One can walk around the outside of the studio, look through the open door and peer through the windows. While to observers the studio seems chaotic, to the artist it was a good place to make Art “ I feel at home in this chaos because chaos suggests images to me”. The Francis Bacon studio at the Hugh Lane Gallery provides a unique window into the world of the artist that was Francis Bacon. It revealed much about the practice of painting used by the artist. Although hundreds of used paint tubes and tin of paint were found , there was no artist palatte found there. 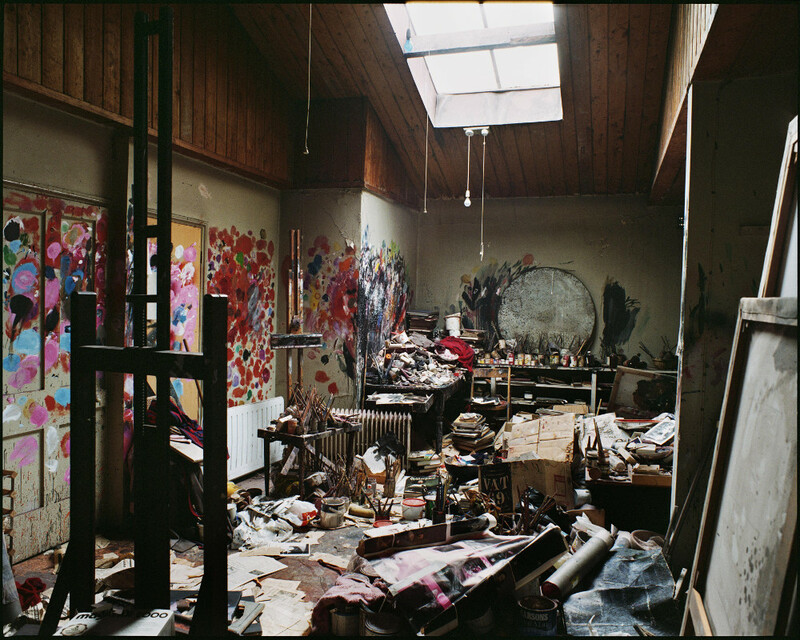 Instead Bacon seems to have used just about any surface he could find as a substitute – even the walls of the studio were used to mix paint. Several pairs of thick corduroy trousers were found in the studio. Many of these were cut into pieces and used in his paintings. The imprint of this corduroy pattern is to be found in several of Bacon’s paintings. Bacon also used cashmere sweaters, ribbed socks and cotton flannels to similar effect. Several slashed canvases were found also in the studio revealing that Bacon exacted very high standards on his work and regularly destroyed his paintings when they did not meet his high standard. 5)The Chambers Room displaying three unfinished paintings by the artist. Francis Bacon; Untitled ( Self Portrait) 1991-1992. 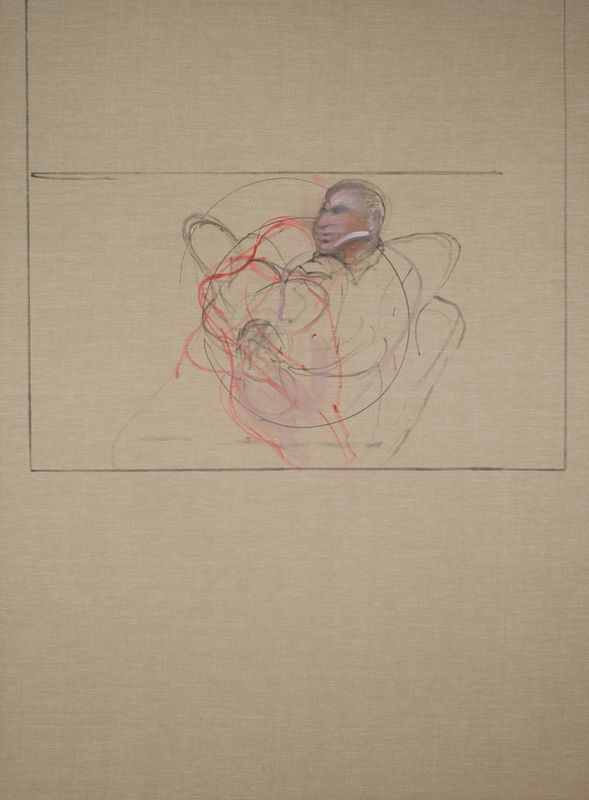 This unfinished self-portrait was found on Bacon’s easel in his Reece Mews studio on his death in April 1992. As is typical of Bacon’s procedure, the background has yet to be laid in. The head of the central figure is the most highly developed part of the canvas. It is unclear how many figures the artist intended to include in this composition. The circular outline may have been drawn using a dustbin lid, The vertical and horizontal lines framing the composition were probably made with a T-square. On entering the complex, it is quite dimly lit and this enables the film screen to be seen clearly. There is a small amount of overhead spotlights. As one approaches the actual studio and one looks at it through the glass it appears to be lit up. This effect is created by a overhead skylight and aswell as enabling us to see the studio more clearly it creates a shrine-like atmosphere to have the space lit up from the darkness of the AV room. The Micro Gallery is also quite dark which is good for viewing the multi-media screens. In this space there are two windows that look into the brighter Bacon Studio. As one enters the Chambers Gallery it becomes more brightly lit by spotlights making it easier to see at first hand the three paintings (uncompleted) by Francis Bacon. As one walks around the complex it is noticeable that there is very little empty wall space; instead the walls are filled with large transferred lines of text. This text consists of a biography of the artists life and quotes directly from Francis Bacon about his practice of painting. Each of the three paintings on display are clearly labelled with a white card that states the artist name, places and dates of his birth and his death, the title of the piece, details about the bequeath and information on the painting. The Micro Gallery provides a great deal of information- a full database which catalogues each item found in the studio. This information can be sorted through by touching the screen. There is also a phone-like device to listen to a commentary aswell as viewing the onscreen visual information. This information greatly deepens our understanding of the practice of Francis Bacon. I was wondering if you could do this for the national gallery of Ireland?